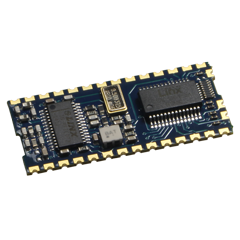 The KH3 Series modules are ideal for wireless remote control and command applications. The transmitter combines the highly-optimized SAW-based LC Series RF transmitter with the DS Series encoder module. The receiver combines the advanced synthesized LR Series receiver with the DS Series decoder. Both modules are configured to use the Holtek protocol and be backwards compatible with previous generations of the KH Series. The transmitter module accepts up to eight parallel inputs, allowing direct connection of switches, contacts, or microprocessor control lines. The receiver module provides eight logic-level outputs for connection of devices under control, such as relays, motors, indicators, or microprocessor lines. Together, the modules form a reliable wireless connection capable of operation over distances of up to 3,000 feet. Ten address lines are provided to allow for the creation of unique transmitter / receiver relationships. The wireless transmitter is capable of generating +9dBm into a 50-ohm load at 5V and +4dBm at 3.3V. The receiver's advanced synthesized architecture achieves an outstanding typical sensitivity of -112dBm. The modules operate in the 3 to 5 VDC range and feature very low power consumption, a wide operational temperature range, adjustable transmitter power, and RSSI output. As with all Linx RF modules, no external RF components are required (except an antenna), which allows rapid integration, even by engineers without previous RF design experience. The modules are also individually compatible with a complete family of FCC pre-certified OEM products, which include keyfob and handheld transmitters, relay and AC control modules. These RoHS-compliant modules are housed in a tiny SMD package that are well-suited to both prototyping and high-volume production.